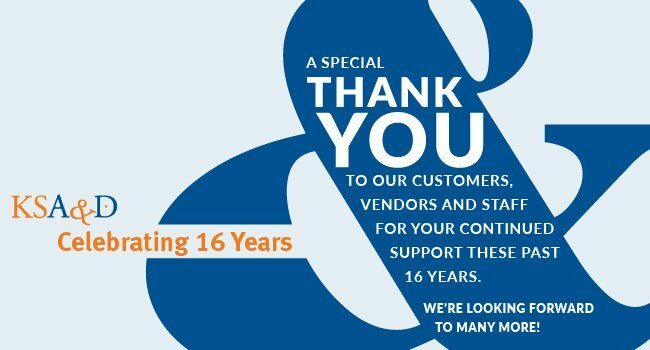 Kraemer, Schurman Advertising & Design (KSA&D), a full-service marketing and advertising agency located in Allentown, Pennsylvania, is celebrating 16 years in business. KSA&D was founded in 2000 by Peter Schurman and Bob Kraemer with a vision of taking clients’ marketing onto the internet. The agency began designing and developing websites after working in a traditional communications agency. Kraemer and Schurman saw the value of an internet presence for businesses and the duo took the leap and started on their own. Over the years, KSA&D grew its staff and its services beyond website design and development. With more than a dozen staff members today, KSA&D offers brand strategy, copywriting, design, media buying and collateral. It’s core business remains digital marketing and includes search engine optimization, search engine marketing, digital ad campaigns, social media services, mobile and web app development, content management systems and e-commerce solutions. “We are very proud of our success. To acknowledge and celebrate our longevity and growth, we are planning to launch the #followmetocreativity campaign with our clients in mid 2017,” says Kraemer. KSA&D will make a donation to the Last Chance Ranch in Quakertown in honor of anyone who travels or goes to an event wearing a KSA&D #followmetocreativity t-shirt and then posts a photo in the shirt on social media. KSA&D recently distributed #followmetocreativity shirts to family and friends, and so far the shirts have been posted being worn in California, Maine, Nevada, Chicago, Colorado and Michigan. KSA&D is a full-service marketing and advertising agency that specializes in digital marketing and brand solutions. By combining powerful messaging with creative delivery, KSA&D influences the decision-making process for its clients. KSA&D is located at 3102 Berger Street in Allentown and can be followed on Facebook, LinkedIn and Instagram. Contact KSA&D at 610-797-7909 or info@ksand.com.